ECU, like many teams this December, is frantically trying to sell tickets to the team's bowl game to students and alumni. ECU, unlike those other teams, isn't actually going to a bowl game. East Carolina University Athletics wants to show the college football world the passion of the Pirate Nation, even in a "bowless" year for the university. The Pirate Club is excited to announce the 2011 Virtual Bowl. Our challenge will be to sell more tickets than our bowl-bound Conference USA opponents and bowl-bound teams from the Big East. The Virtual Bowl appeal will go through December 23. Tickets for the Virtual Bowl are $50 a piece and can be purchased by calling the Pirate Club Offices at 252-737-4540 or by going online at ecupirateclub.com. Virtual Bowl tickets purchased will be tax deductable and donors will receive one priority point for every ticket purchased. All proceeds from the Virtual Bowl will go towards the "Step-Up To The Highest Level Campaign". Go Pirates! There's no bowl, no stadium, no game, no fans. It's just an original way to raise money for a new basketball practice facility, and an attempt to show that Pirate fans are more passionate than their CUSA and Big East counterparts. While we have no problem with creativity, there are two reasons that "selling out" their bowl wouldn't be much of a thumb in the eye of other schools. First, since there's no game, there's no commitment. Pirate fans have to shell out the money, and then do nothing. Whereas fans of Southern Miss, who won CUSA East, would have to shell out the money and then take care of their own transportation to Hawaii. Virtual Bowl tickets would be more realistic if you had to buy them and then fly to Idaho to check in. Second, the bowls don't particularly care how many fans of each team shows up—they get the money anyway. The bowls give each team a "ticket allotment," and charges them money for it. Then it's up to the school to sell their tickets and recover their losses. 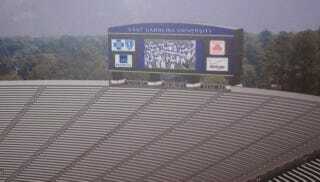 (For example, at last year's Military Bowl, ECU was forced to buy 10,000 tickets. They just barely sold them all.) So even if the "Virtual Bowl" outsells Marshall's or Louisville's allotments, it's not going to convince bowl committees to give ECU extra consideration next year.